"Then took they Jesus with them and led him away, and he bore his cross. And he went along with them to a place called the Place of Skulls, which is in the Hebrew tongue, Golgotha." J.S. Bach composed in many forms, but because he was a deeply religious man it is no wonder that many of his greatest works have a biblical subject. At least three times, and possibly as many as five times, he wrote oratoria based upon the passion story as related in the various gospels of the New Testament. All of those are lost now but for two, the massive St. Matthew Passion, and its somewhat more compact but possibly more deeply heartfelt brother, the St. John Passion. The oratorio form was peculiarly suited to the passion story, with its drama; one could use it to sneak opera into the church where it would otherwise be anathema. The basic story, heavily leaning on the gospel text, is told in recitative by the Evangelist (Gerd Tuerck, I believe). Interspersed with the narrative thread are choral pieces and arias for soloists. The dramatic give and take between Jesus and Pilate is powerfully brought across in this manner. The production here, presented live in Tokyo's Suntory Hall, is an historically informed performance; one can see all manner of oddball variants of woodwinds in the small orchestra. As part of the historic character, the sizes of the orchestra and the chorus are both quite limited. The entire chorus runs to a mere 16 people, and the soloists (other than the Evangelist) are all members of the chorus rather than being a separate and distinct entity. This diminished size works well for the material; the music gains a transparence and variety of texture that is lost in a larger ensemble. However, the performance is quite well miked, so that we are seldom lacking for sound. I mentioned that I believe that Gerd Tuerck was the Evangelist, but the program and the insert neglect to identify anyone, so I'm forced to guess at the identities of the soloists based on the relative importance of their parts and the order their names appear in the credits. Whoever it is in the role of the Evangelist does a fine job, conveying drama, emotion and sensitivity with a clear, bell-like tenor voice. The countertenor (whom I know to be Robin Blaze) has only a few moments in the spotlight, but he definitely makes the most of one of them: Blaze gets the aria dealing with the death of Jesus on the cross, Es ist vollbracht (It is fulfilled), and he gives this a haunting rendition, reaching effortlessly into the highest stratospheres of the male voice. The result is truly breathtaking. The other soloists are capable enough, but unremarkable. One, whom I believe to be Stephan MacLeod, has an irritating habit of clearing his throat into the mike; surely there was some way to reduce this racket in the mastering process? The chorus is a shade ragged on releases. This small ensemble size requires extreme precision, which is otherwise satisfactory. 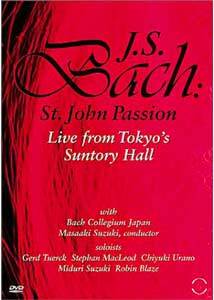 The Bach Collegium is conducted by Masaaki Suzuki, who was a student of noted Bach interpreter Ton Koopman. Directing from a harpsichord, Suzuki provides a suitable interpretation that at times borders on the rapturous. From the outset, one is carried away by the minor-key undulations that remind the listener of running water. This motif is emphasized throughout the piece, often in the flutes, and provides a suitable setting for the climax of the most mystical gospel. Image Transfer Review: The anamorphic widescreen picture is generally quite attractive. Skin tones are well rendered and black levels are good. As usual for a concert performance, the palette is extremely limited. The only anomaly I detected was a tendency to artifact on pans over the chorus. Such moves are infrequent and not too troublesome. The picture is fairly sharp and well-detailed. Audio Transfer Review: The audio is provided in both 5.1 and Dolby Surround. Both are quite good indeed, with the 5.1 having a slight edge for a somewhat beefier bass and midrange. The performance is well-miked, and when the vocalists are singing very softly they can still be heard clearly. The sound is detailed and rich, with sound spread to all five speakers; I did not, however, feel any particular directionality to the sound, but rather felt plopped into the middle of the performance. Some may dislike this effect. Range is excellent, and no distortion was audible. The pipe organ that at times forms part of the continuo gives a solid foundation without being obtrusive. The audio is quite clean and free of noise and hiss. Japanese audiences seem to be well-behaved, for there is almost none of the coughing, rattling and shifting that so often plagues American and European live concert productions. Extras Review: First, the positive. The piece is well-chaptered, with each significant section of the text having its own chapter. Now, time for a lengthy rant. This is yet another in a long line of Image classical music discs where the buyer gets absolutely nothing in addition to the music itself. What is the problem here? If one went to the concert, there would almost assuredly be lengthy text materials regarding the work performed, the composer, the artists, the historical background and the nature of the performance. Where are the liner notes? Where is some information on J.S. Bach? Do we have any information at all about this, one of the great pieces of music? Nope. Do we have any indication as to whether this is the 1725 version (written in Bach's prime) or the revisions from 1749 (the year before he died)? Nope. Doesn't this seem relevant? Does Image think classical music lovers don't know how to read, or don't care about background (Hint: they can, and they do). Why isn't there any perspective provided here? Heck, even identifying the vocalists for us would be a start. But nothing, absolutely nothing. It's hard for me as a reviewer to recommend purchase of a disc like this that provides no context or background information of any kind. One gets the feeling that Image (and other studios putting out such barebones discs) really doesn't care about this audience. Yes, it's a little more work, and it might cost a few dollars, but it would be a result you could be proud of, I could happily recommend, and music lovers could purchase knowing they wouldn't be set adrift on the seas of one of the most complex works in the repertoire without any information whatsoever. Oh, and the layer change is awkward and seems to take forever. There, rant done for now. But don't let it happen again. If it weren't so well chaptered, I'd give this an 'F' grade.